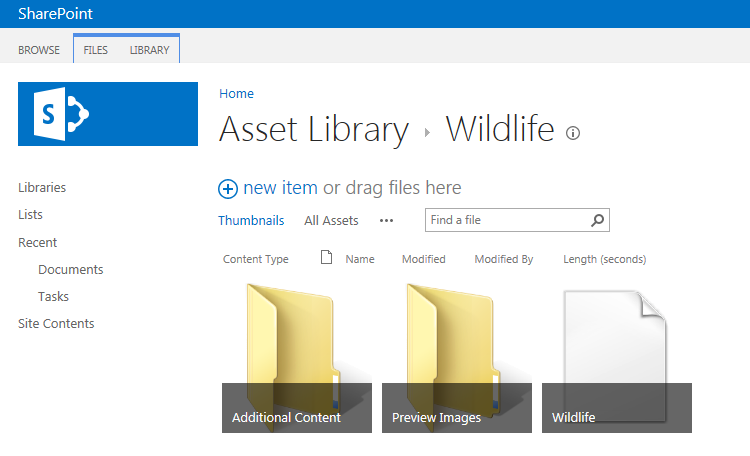 In SharePoint 2010 a new library type has been introduced called Asset Library. This Library is very suitable for storing rich media content like Audio, Video and Images. The library also contains a view by default which shows thumbnails. In SharePoint 2013 this functionality has been changed slightly. In this post I will mention some changed functionality and also some internal technical changes, which you need to know when using it in custom web templates or code. 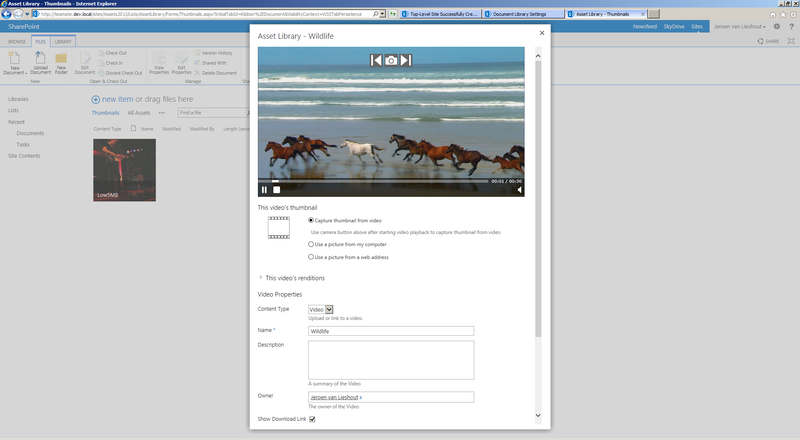 The video player in SharePoint 2013 which allows to play video’s directly from browser. The upload video screen shows the option to select a thumbnail directly from video, image or web address. As seen in the screenshot the video can be played and the snapshot button can be used to select the frame for thumbnail. This is pretty cool functionality which is very helpful for end users to recognize the video’s uploaded other than only the filename. To make this new functionality possible the inner workings of the video content type has been changed slightly. 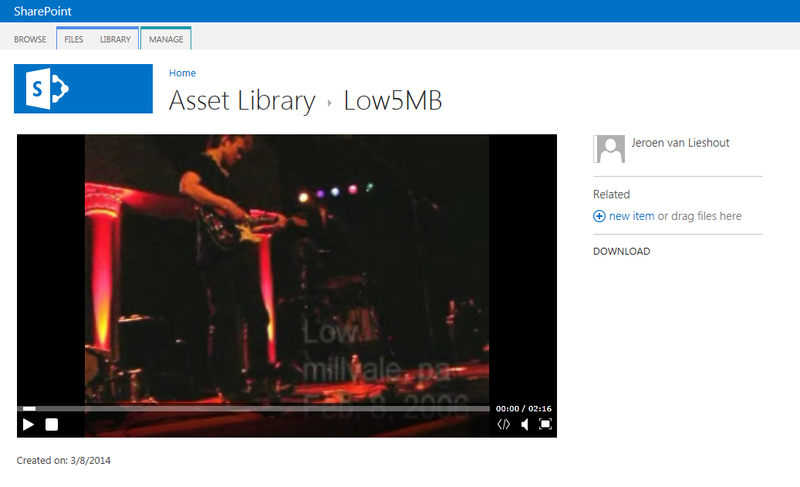 A new video content type is now added directly to the Asset Library when creating one. The old video content type is now called “Video Rendition”. When creating a new Asset Library two video content types are associated by default. The video file itself is actually a folder containing some sub folders and the video itself. As you can see there is a folder named Additional Content, Preview Images and a file called Wildlife. Wildlife is in this example the video itself, which is called a Video Rendition. One video can contain multiple renditions so its possible to have multiple video’s here. I will come back to that later. The Preview Images folder actually contains the thumbnail images which are uploaded for the video or generated for the video. The Additional Content might contain other files but is most of the times empty. The player page which is opened when opening a video is actually a Document Set Welcome Page which is associated to the Video Content Type. It opens automatically a page called Forms/Video/videoplayerpage.aspx. So if you want to customize something with video’s and players then you can start there already. Now let’s come back to video renditions. It is a feature to make it possible to provide video’s for users with a lower bandwidth available or doesn’t want to download a high resolution version. For video’s this can be managed from the edit properties page for a video and then on the down left corner you can manage the video renditions. The video rendition page makes it possible to upload multiple versions of a video. When the bit rate is specified as metadata then this will be used to automatically show the video with the lowest bit rate. It is also possible to force one version to be shown as default. This can be managed per video individually. The settings screen provides the ability to enable/disable automatic metadata extraction and preview image from video’s uploaded. Also preview from video renditions hosted outside SharePoint can be enabled/disabled. This entry was posted in SharePoint and tagged Asset Library, Audio, Changes, Images, Rich Media Content, SharePoint 2013, Video on 8 March 2014 by captain007. Nice blog post and good to know about the content type inheritance change. 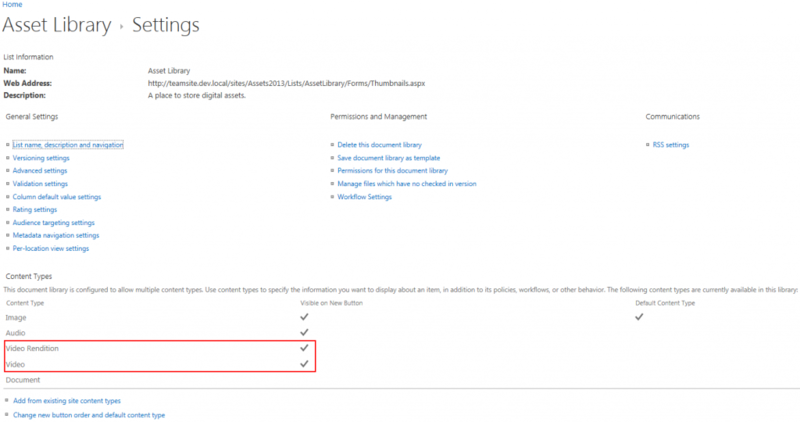 I am new to sharepoint 2013 Asset Library and I am facing problem on list validations for custom columns. I want check DueDate should not be greater than ExpiryDate.I am writing formula as below. [DueDate]>[ExpiryDate] it shows message(It should be greater than expiry date).It works for all sharepoint lists and libraries but only it is not working for Asset Library.It is showing sharepoint default error message screen like (Some thing went wrong in list validation)why it is not showing custom error message I given. If u know this please help me out it will through me out from the requirement gap. I don’t know about List Validations in combination with an Asset Library as I didn’t use it in my customizations. Have you also tried it with different colum types which doesn’t store Date Time data, like normal number columns? The link provides a general description about how ONET files are set up and which sections you can use. I don’t have experience with Bindtuning, so I don’t know if they’re using site templates with ONET files. I suggest you don’t modify supplied ONET files as this changes the OOTB behavior of templates. Only make changes to your self created ONET files when you deploy your own farm solutions. Another possibility is to script such thing using PowerShell and the CSOM API. Another good thing is the PnP Framework which also provides logic for provisioning sites including feature activation/deactivation, which is also suitable for Office 365 environments: https://github.com/OfficeDev/PnP.